Oxford University’s Exeter College is world famous and alumni include JRR Tolkien, William Morris, Alan Bennett and Philip Pullman. Its chapel and choir are renowned and some students even choose the college for its choir. Such is the importance of the chapel to the college, when it came to improving the lighting in the choir stalls, it was important to use a lighting specialist who truly understood the challenges. We were the natural choice. We worked in close partnership with Oxford architect Robert Montgomery to meet the complementary requirements of his design specification and the choirmaster’s desire for better illumination for his choristers’ sheet music. The end result was 16 highly polished brass fittings that hold candles but also have LED lights housed in the underside of the fittings’ collars. 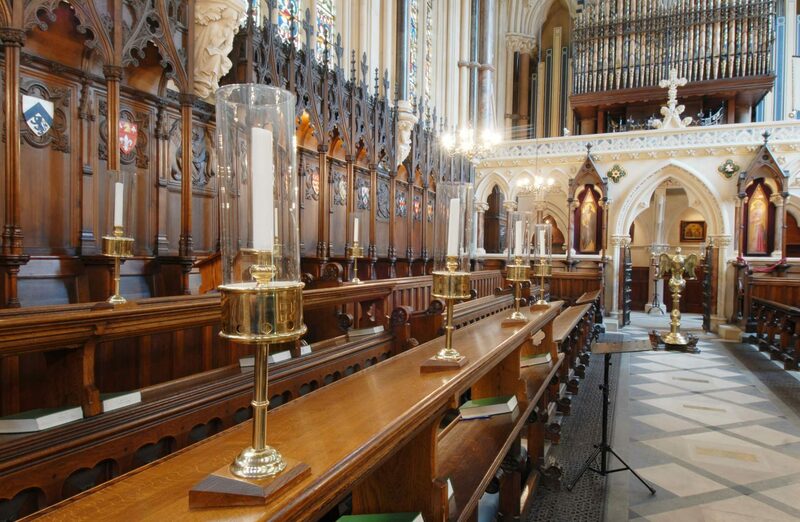 This allows the choir stalls to retain the traditional ambience of candlelight, while also have lighting that’s bright enough for the choristers but cool enough to ensure the candles don’t melt.